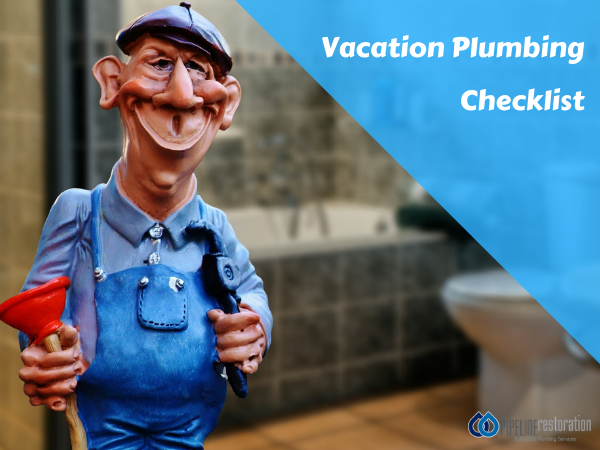 Vacation Plumbing Checklist: Plumbing To-Do's Before You Leave for Vacation | Pipeline Restoration Plumbing, Inc. If a pipe or component of a utility source leaks or bursts while you’re absent and the primary valve is open, water will keep on running or spewing. Therefore, before leaving for vacation, it is advised that you turn the main valve off to prevent water from running. Other reasons people prefer to shut the main water valve during their absence is because it stops any kind of water theft, saves cost and conserves water. Reviewing for leaks and working proactively can aid in saving both expenses and water. Examine all the plugs in sinks, bathrooms and outdoor facets to ensure they are firmly closed and not leaking or oozing out water. Feel at the bottom of faucets and taps and the pipes below them, especially at joints. If your examination exposes any drips, leaks or stains, get them reviewed before leaving. Departing from a fresh home only to arrive at a smelly home can be uninviting and inconvenient. So before leaving on an extended vacation, it’s advisable to flip your garbage disposal switch to make sure there are no food particles around the base of the unit. As an additional precaution, you can conveniently clean your garbage removal by introducing baking soda and vinegar to the drain, then proceeding with citrus peels to have the disposal smelling fresh. Your water does not need to be heated while you are away from home. If you do not have a house-sitter for your home supervision in your absence, modify your water heater settings to “vacation” or turn it off completely. Although this may not count directly as a plumbing issue, it will impact your utility cost. Similarly, if you own a home-spa, maintain a suitable thermostat on that as well during your vacation. Please make sure you DO NOT switch off the water pump for your pool/spa because it can lead to quick algae growth. If you have appointed a friend, family member, or acquaintances to stop by and oversee your house in your absence, make sure you offer them with a compiled list of emergency contact number, and that includes your plumber! When you’re going away for a long seasonal vacation, it’s a perfect time to schedule a house inspection by a good plumber, a few weeks ahead of your departure. If any issues are detected, you need time to resolve them before your exit.